You'll be £19.99 closer to your next £10.00 credit when you purchase Fuehrer Headquarters Wolf's Lair DVD. What's this? In the autumn of 1940, the decision was made by Hitler to construct a base of operations from which Operation Barbarossa could be planned and instigated. This almost impenetrable series of structures, located in the Masurian woods near the town of Rastenburg, welcomed the Fuehrer for the first time on the 23rd June, 1941. 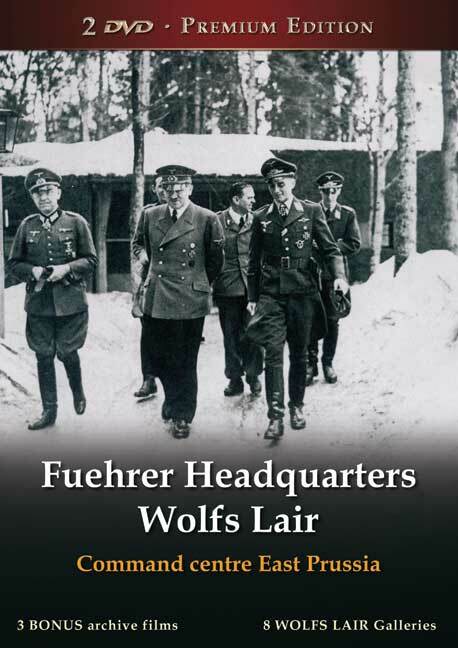 Although Hitler had a number of similar bases built throughout Europe, the Wolf's Lair was by far his preferred location, spending a total of over 800 days there during a three and a half year period. In that time, a number of key decisions were made there that drove the Eastern campaign against Russia, as well as a failed assassination attempt on the Fuehrer himself. This Special Edition 2 Disc DVD helps to reconstruct the story of this extremely secretive and fascinating centre of Nazi operations, from its original design and construction in the early 40s to its continued use by Hitler and eventual demise as the war came to a close. For the first time on DVD, actual witnesses are interviewed and reveal their personal stories about Hitler, giving an insight into some of the planning behind the infamous Eastern Campaign. Also featured is an in-depth analysis of the attempted assassination on Hitler by German Army Officer Claus von Stauffenberg, whose exploits were recently portrayed on the big screen in the film Valkyrie. With much original and rare archive footage, this fascinating Special Edition 2 Disc DVD set helps to reconstruct the story of this extremely secretive centre of Nazi operations, from its original design and construction in the early 1940s to its continued use by Hitler and eventual demise as the war came to a close. Also featured is an in-depth analysis of the attempted assassination on Hitler. This Special Edition 2 disc Dvd helps reconstruct the story of the extremely secret and fascinating centre of Nazi operations. For the first time on DVD, actual witnesses are interviewed and reveal their personal experiences and stories about Hitler. Included are masses of original and rare archive footage. And also covers the attempted assassination of Hitler by Claus Von Stauffenberg. This DVD will appeal to all second world war enthusiasts. Pen and Sword Digital have teamed up with German filmmakers History Films to offer a selection of documentary films covering military, aviation and maritime subjects from the First and Second World Wars. These fascinating military DVDs present original and rare archive footage, much of which has not been seen outside of Germany, along with special features and galleries.